Hope Springs Movie Sometimes to keep the magic, you need to learn a few tricks. After 30 years of marriage, Kay and Arnold Soames attend intense marriage counseling from Dr. Bernie Fields. Hope Springs release date was Wednesday, August 8, 2012. This was a Nationwide in theaters release. 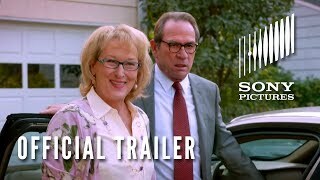 Kay (Meryl Streep) and Arnold (Tommy Lee Jones) are a devoted couple, but decades of marriage have left Kay wanting to spice things up and reconnect with her husband. When she hears of a renowned couple’s specialist (Steve Carell) in the small town of Great Hope Springs, she attempts to persuade her skeptical husband, a steadfast man of routine, to get on a plane for a week of marriage therapy. Just convincing the stubborn Arnold to go on the retreat is hard enough – the real challenge for both of them comes as they shed their bedroom hang-ups and try to re-ignite the spark that caused them to fall for each other in the first place. Where was this movie filmed? Filmed throughout Connecticut, notably in Stonington, Guilford and Norwalk. Was this film based on a book? No, Hope Springs is based on an original screenplay by Vanessa Taylor.